Your recipient will have the opportunity to sample some of the world’s finest coffees. Also available is paraphernalia to grind, brew and serve the coffee. Under teas & provisions they will find a small selection of exceptional biscuits, preserves, condiments and sauces to choose from – which, like our coffees, are difficult to obtain in this country. 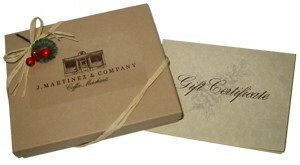 The J. Martinez Gift Certificate is attractively boxed to ensure that your recipient enjoys the pleasure associated with receiving, and opening, a gift.